Jen Sabrowsky Military mom surprises her son in sweet reunion. A few months ago, Sgt. Jen Sabrowsky proved she was the coolest mom in all of Appleton, Wisconsin. 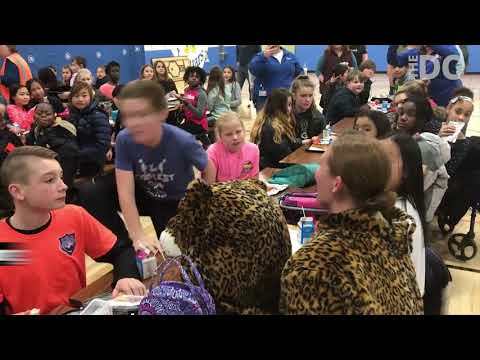 Disguised as a jaguar — McKinley Elementary School’s mascot — she entered her sixth grade son’s lunchroom for an incredible homecoming surprise. After high-fiving with the other students, Sabrowsky sat in front of her unsuspecting son, Jake, and removed the furry costume’s head. Once Jake realized who was under the silly suit, he shot out of his seat and yelled “Mom!” before running around the other side of the table to give her a love-filled hug. “He was coming in hot,” Sabrowsky told USA TODAY NETWORK-Wisconsin. Both Jake and Sabrowsky’s stepson hadn’t seen their parent in months. She’d been away since last April, serving in the Middle East with Company D of the 1-147th Aviation Battalion. Thankfully, McKinley’s staff was more than willing to help her make arrangements while she was away. McKinley principal Andrea Vinje described the heartfelt reunion as one of the most memorable moments of her career. Fortunately for us, the sweet moment was caught on video for the whole world to see. So far, the tear-jerking clip has received more than 13,000 shares — and after watching, we can definitely see why.